Cafe Corvina is situated in the site of the former Antonios Restaurant and previously Sepia. Right in the heart of Grahams Road, we are in walking distance from both the retail park and just round the corner from Falkirk’s Grahamston Station. 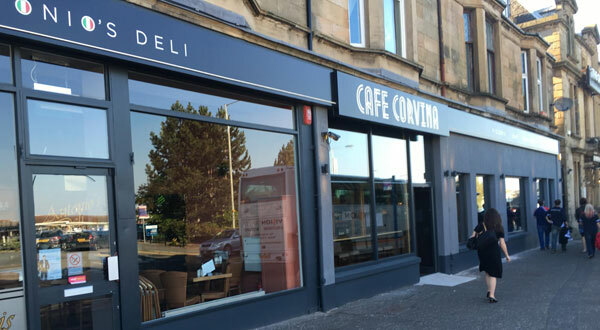 Cafe Corvina first opened its doors in May 2016 as an Italian restaurant. It was formerly known as the Antonios Ristorante and also the Sepia in the 1990’s. It was an Italian restaurant. Nowadays customers often come in and start reminiscing about how they spent their days dining and being entertained. Set in the heart of Falkirk’s Graham Road (right opposite the Retail park and round the corner from Grahamston Station), we cater for all types of diners in our restaurant. Be it from a coffee with a snack and business lunches to intimate candlelit dinners and family gatherings, we will always endeavour to accommodate you and your guests, whatever the occasion. Indeed our pre-theatre menu is popular for cinema goers before they go with the latest blockbuster. In a relaxed and recently renovated surrounding, where your comfort is given priority, enjoy our classical Italian a la carte menu with a modern flair together with a wide choice of carefully selected award winning Italian wines with the knowledge that we strive for perfection and continuously aim to better ourselves to give you a memorable time in our restaurant. Service with friendly and non intrusive staff, we are only too happy for any special requests you may have. Having owned and managed Italian restaurants for over 20 years, owners Gianni and Tony Crolla have worked with food and the public for all of their years, they know only too well what you expect when you go out and dine and do so with passion which shines through all of our staff too. Attention to detail is what sets this restaurant aside from others. Customers are often overwhelmed when, returning to the restaurant, staff remember their names and preferred drinks. There are restaurants and there are good restaurants, and, to be the latter, the use of fresh and top quality ingredients, whether local or uniquely sourced and imported from Italy is a must. A great amount of time is spent choosing top value wines from Italy’s many wine producers and believe our wine list offers something for everyone.